VAN WERT – Vantage held a brief regular Board of Education meeting on Thursday prior to their annual All Boards Dinner and Alumni Hall of Fame Induction Ceremony. During the regular meeting, Superintendent Rick Turner said that he and Treasurer Laura Peters will be attending a meeting in Columbus next week to discuss how a new funding model will impact career technical education. Turner also said that Vantage is in the data collection and compiling stage of building their five-year strategic plan. 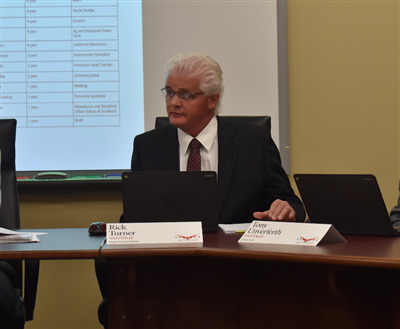 Turner said that Vantage has seen that the number of students in the current sophomore class across the 13 schools Vantage serves is the smallest over the next five years and that this is information that helps them build their strategic plan. The Vantage and Ohio Technical Center Directors submitted their reports to Board members prior to the meeting. - Accept the resignation of Charles Peters, CDL Training Manager, effective June 1, 2019. - Approve the employment of James Rosen as CDL Training Manager, effective June 1, 2019, for the remainder of the 2018-2019 school year, and approved the employment of James Rosen as CDL Training Manager, effective July 1, 2019, for the 2019-2020 school year. - Employ the following list of employees for Vantage Career Center: Larry Davis - Auto Technology, David Delano - Construction Equipment, Samantha Heckler - Intervention Specialist, Jamie Kipfer - Math, Sarah Koch - Social Studies, Matt Miller - Science, Mike Miller - Ag and Industrial Power Tech, Kevin Van Oss - Industrial Mechanics, Heather Brickner - Intervention Specialist, Rhonda Davis - Preschool Head Teacher, Zacharia Miller - Criminal Justice, Gary Cearns - Welding, Mickey McConahay - Part-time Guidance, Darrell Miller - Attendance and Discipline Officer (Dean of Students), Audrey Stechschulte - Math, and Wendy Baumle - Senior Health Technology. - Employ the following list, as Ohio Technical Center instructors, as needed, as scheduled: Joanne Simmerman - Medical Assistant Instructor, Shawn Cook - Police Academy Instructor, Cassandra McCord - Practical Nursing Program Instructor, Mark Ernst - Police Academy Instructor, Bruce Showalter - Assistant Police Academy Commander, Kelli Bergstrom - Practical Nursing Program Instructor, Kelli Bergstrom - Practical Nursing Program Instructor, Jarrett Funk - Fire Fighting Instructor, and Lea Purk - Medical Assistant Instructor. - Resolution to waive the 45-day notice and approve the City of Van Wert Residential Community Reinvestment Area Agreement between Vicki Hoersten of 369 Dover Drive, Van Wert, Ohio, and Vantage Career Center. - Resolution to waive the 45-day notice and approve the City of Van Wert Residential Community Reinvestment Area Agreement between Chadd and Krista Dailey of 327 N. Washington St., Van Wert, Ohio, and Vantage Career Center. With no further business, the Board adjourned to attend the Vantage All Boards Meeting and Vantage Hall of Fame Induction. The next meeting is set for Thursday, May 2, 2019, at 7 p.m.